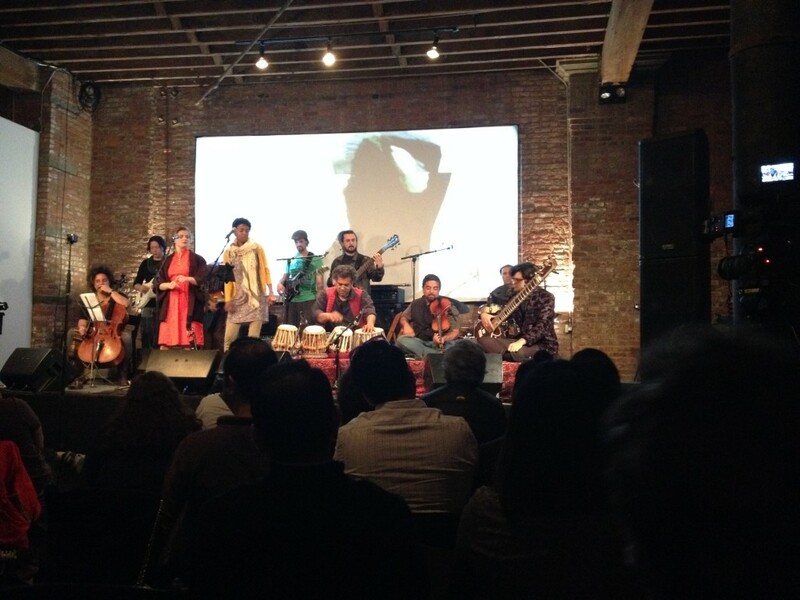 The Brooklyn Raga Massive All Stars have once again put together an innovative approach to raga and its musical compatriots. This time, they concocted a raga and classic rock mashup entitled “The Raga Remains the Same.” The concert featured the music of Led Zeppelin, Jimi Hendrix, Pink Floyd, and others. It’s an interesting bit of synchronicity that these songs were performed on 4/20…but this is a family publication and I must not bring these things up! One thing that was new was a VJ. Throughout the show, video imagery was projected behind the band. It was obvious that great care had been taken in selecting the imagery. The continued with the Beatles’ “Tomorrow Never Knows.” The connection this song has with raga is obvious. Arun Ramamurthy played the alap on violin. Murghai started the melody, and Sami Stevens and Jordan Morton sang the lyrics. Their harmonies were quite inventive, and pleasing. Drummer Vin Scialla had a nice reinterpretation of Ringo’s original drum part. Arun took one of his usual beautiful solos. Geisler took a guitar solo that had psychedelia by way of jazz chops written all over it. Guitarist David Ellenbogen‘s solo was even more psychedelic, without losing the relevance of the song’s integrity. Murghai and Ramamurthy vacated the stage for Pink Floyd’s “Breath.” Tyree donned a slide (to handle David Gilmore’s classic parts) and Hughes handled the solo. Her liberal use of harmonics and vocal like melodies complimented the guitar quite well. Sameer Gupta‘s tabla parts were almost entirely ornamental. Hughes played a marvelous solo through a wah pedal (even I never heard this done before!). The VJ’s choice of imagery, video from the Apollo 11 mission, was appropriate to the music. Geisler stepped to the front for a solo, and led it to its conclusion. 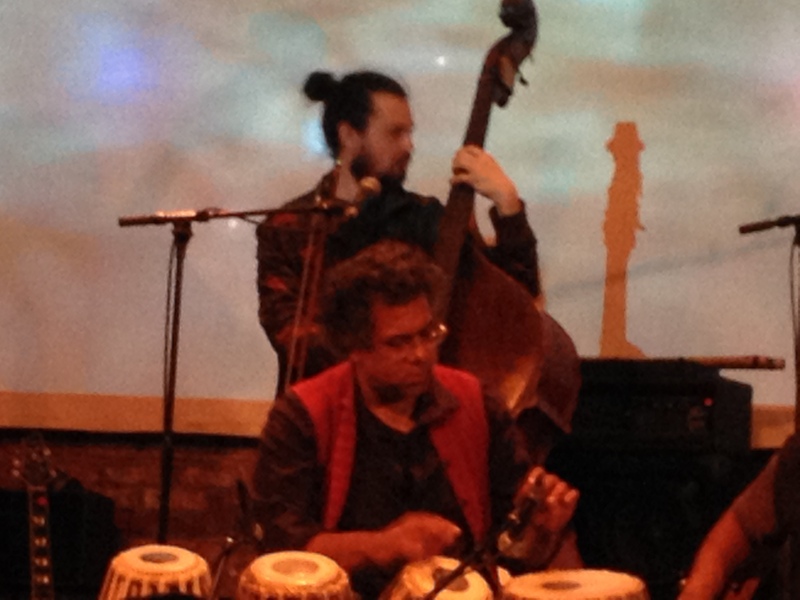 Ghandi and Scialla left the stage, and Gupta and Murghai returned, with Jordan Morton on upright bass. This time, they returned to the Beatles, with “Across the Universe.” Morton accompanied herself. After an almost rubato beginning, a gentle rhythm was established over which her contralto vocals and an ethereal framework rose. The song floated to a gentle conclusion. Cello left the stage, Ramamurthy, Geisler, and bassist Michael Gam returned. They took on Radiohead’s “Pyramid Song”. Ramamurthy took the lead with the two acoustic basses establishing the rhythm and harmony. Morton sang the lyrics. Ghandi’s violin weaved in and around the tapestry of sound with Gupta’s tabla chasing him through the labyrinth, sometimes quietly, sometimes as madly as a satyr. The song faded to a dreamy conclusion. After Ellenbogen and Tyree returned and Morton left, they pulled an interesting thing out of their bag of musical tricks. They blended an 18th century composition by Carnatic raga composer Tyagraja, with Led Zeppelin’s “Ocean”. In the beginning, Ramamurthy‘s violin took on a very different voice than the previous song. Here, he was very much in touch with his classical roots. Murghai responded with his usual tasteful sense of melody. They brought the song to an ecstatic climax . 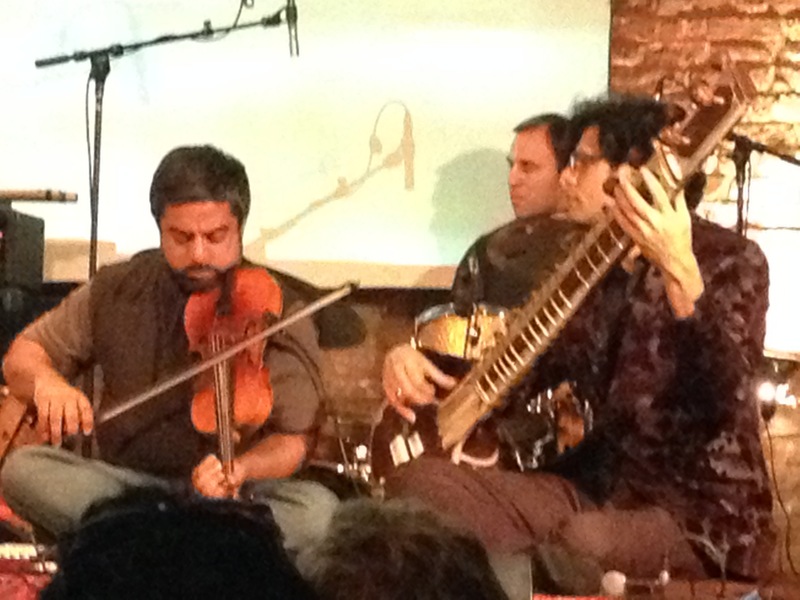 Gupta, Ramamurthy and Geisler left the stage, and cello returned for a return to the Beatles repertoire. “While My Sitar Gently Weeps” featured Murghai. He really outdid himself on this; drawing a sense of poetry from his instrument in a way that made the song his own. Hughes followed his lead with a comparable sensitivity. Then, vocalist Pyeng Threadgil came on and the song became “Dear Prudence.” Threadgill brought her own inimitable and gently bluesy vibe to the song. Tyree offered his own say on his guitar solo. The Rolling Stones’ “Paint It Black” was next. Geisler played guitar, Thredgill remained on vocals. Geisler did a very “eastern” and very dark solo to begin the song. Murghai played a bit with insinuating the melody, then, the melody finally emerged. They treated it with the darkness and mild insinuation of depravity the song demands. After all the other musicians returned to the stage, a thick and funky take on Hendrix’s “Who Knows” emerged. Threadgil and Stevens sang. 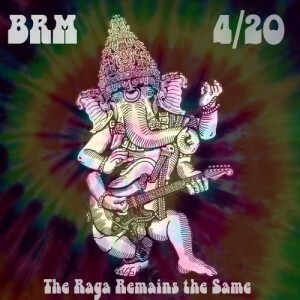 Ramamurthy took a bluesy solo, Hughes brought out the wah again in a very inventive manner (at first, I was actually looking to the guitarists wondering who was playing the wah guitar so brilliantly), and Tyree‘s Hendrixian solo had “BMF” written all over it. They ended with Led Zeppelin’s “Kashmir.” The song was the blow out / free for all the encore demanded. Gupta took a tabla solo that was brief, but hit as hard as Muhammad Ali when he annihilated Sonny Liston, and was just as graceful. Everyone wrung every drop of musical intensity and passion from the song. It’s refreshing when someone brings new life to old favorites. Now, these are the songs from my own youth. They hold a special place in my heart. Most people who cover them simply imitate what’s been done. Anybody can do that. Not the BRM All Stars. They showed us jewels of musical possibilities within these songs waiting for someone to bring them out and show their beauty to the world.